Prime Time Manufacturing has expanded its product offering with the introduction of the company’s first fifth wheel, the mid-priced Crusader. Full production of the new Crusader started in June and Prime Time officials recently delivered the first production model to General RV, in Wixom, MI. Loren Baidas, President of General RV, and several members of the dealership’s management and sales team were presented with the 2011 Crusader 270RET fifth wheel by Prime Time president Jeff Rank and Chris Hermon, Prime Time’s VP of sales. According to Rank, “General RV is not only one of Prime Time’s largest dealers, but also a huge dealer for all of Forest River. When we started the company, General was one of the first dealers to come aboard and we are thankful for their continued commitment and support of Prime Time Manufacturing. 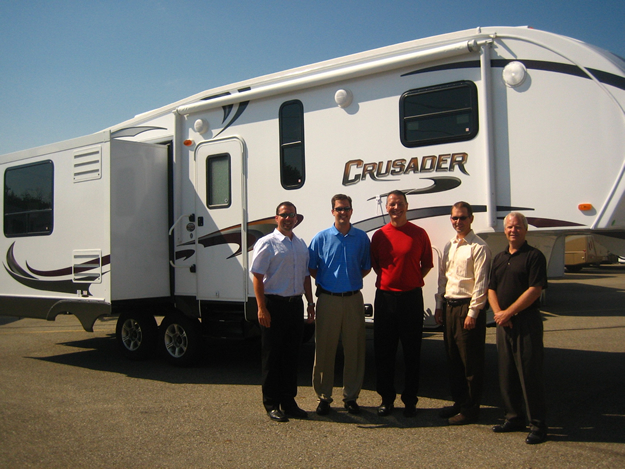 It’s an honor to deliver this very special Crusader fifth wheel to Loren and his team”. Pictured from L-R: Chris Hermon, Loren Baidas, Jeff Rank, Wade Stufft; Director (VP) of Operations for General RV, and Dennis Anderson; Director (VP) of Marketing/Advertising for General RV. General RV, with 9 locations, is the nation’s largest family owned dealership. In acceptance, Baidas was quick to compliment the young company, “The new Crusader has a great look and lots of easy to sell features. It will definitely be a nice addition to our dealerships. Prime Time is quickly becoming a bigger part of our business plan and we are excited to be a factor in their rapid growth”. After the presentation, Hermon was able to show several unique features of the new Crusader including the innovative Super Turn front cap, Slam Latch pass thru baggage doors, Quiet Cool ducted return air conditioning, and solid cherry hardwood cabinet doors and drawers. During the walk-thru with the dealership, Hermon emphasized, “We’ve loaded Crusader with features not normally found on a mid-profile fifth wheel and priced it very aggressively to deliver more value.” Additional Crusader upgrades on the 270RET include solid surface countertops, an RCA Soundwave entertainment system, bumper mounted swing arm grill, hitch cover, and a 42” LCD with electric lift. Base MSRP of the new Crusader fifth wheel is $29,500. For more information regarding Prime Time Manufacturing and the LaCrosse, Tracer, and Crusader brands, please consult www.primetimerv.com or call (574) 862-3001. Prime Time Manufacturing is a division of Forest River, Inc, a Berkshire Hathaway company. Prime Time offers towable Recreational Vehicles under the brand names of LaCrosse, Tracer, and Crusader and is located in Wakarusa, IN.